Syrian Arab Republic media on 04NOV15 claimed its forces have reestablished line of communication (LOC) to western Aleppo, by means of securing the Ithriya-Khannaser highway. 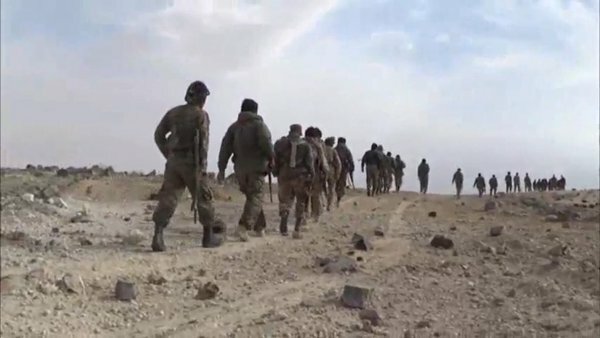 SOHR confirmed the Syrian Arab Republic frontline with ISIL had been successfully pushed forward about 10 kilometers from the route. Pro-Syrian government T-72 main battle tank display ISIL flag trophy, claimed depiction on the Ithriya-Khannaser Highway. 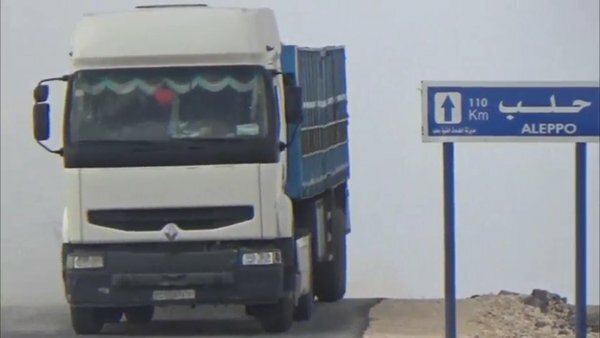 Pro-government supply vehicle claimed carrying supplies on the Ithriya-Khannaser Highway, on 04NOV15 breaking the siege imposed on Western Aleppo by ISIL. Light infantry belonging to force fighting on the side of the Syrian Arab Republic, securing the Ithriya-Khannaser Highway. 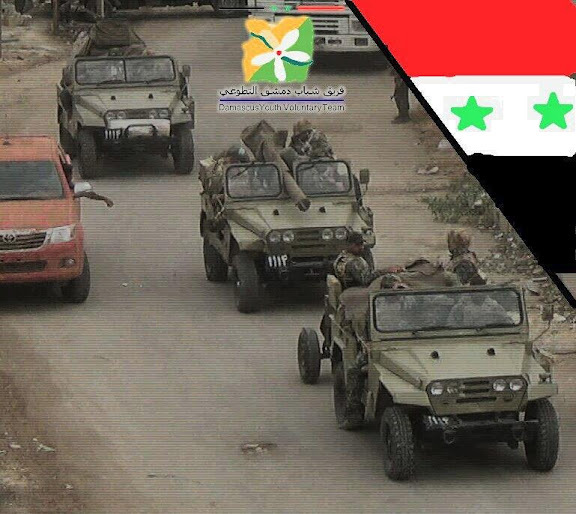 Iran-backed forces equipped with Iran-supplied Safir ("Ambassador") tactical vehicles; claimed depiction at the southern approaches to Aleppo. 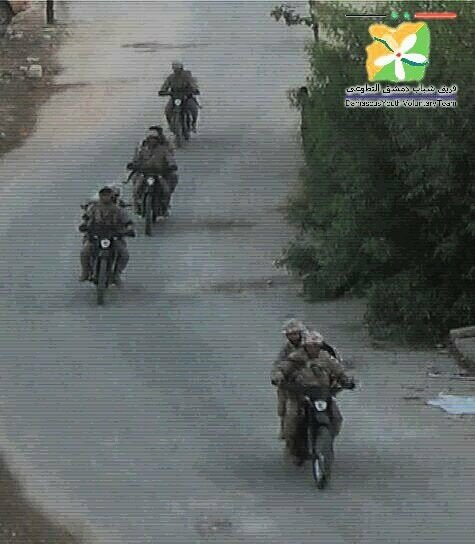 Motorized infantry on motorbikes in manner of deployment consistent with IRGC/Basij; claimed depiction at the southern approaches to Aleppo. 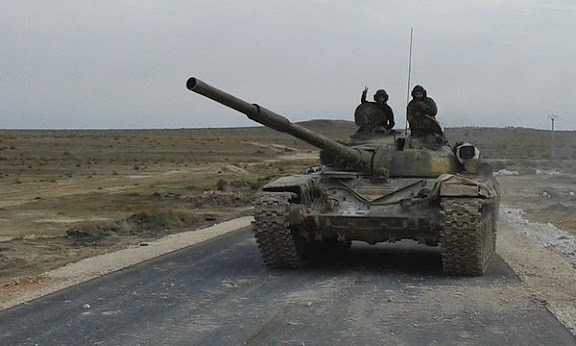 Iran-backed forces deploying 2S1 Gvozdika ("Carnation") type 122 mm self-propelled howitzers,;claimed depiction at the southern approaches to Aleppo. 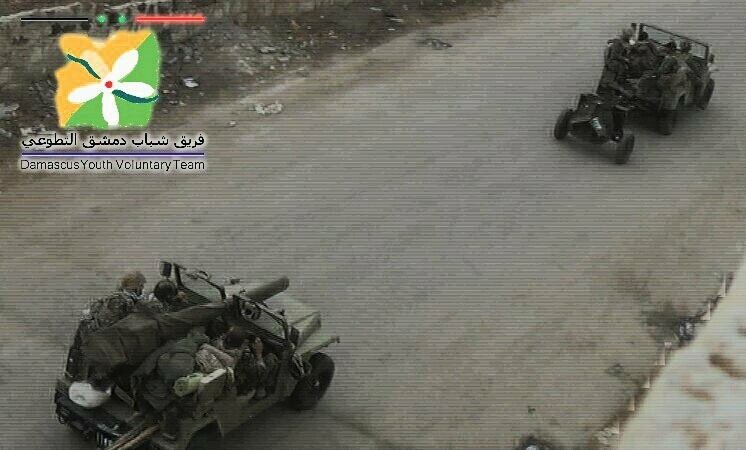 Iran-backed forces deploying improvised rocket-assisted munition (IRAM) launcher vehicles; claimed depiction at the southern approaches to Aleppo. Iran-backed Iraqi Katai'b Hezbollah fighting force fielding T-72 main battle tanks; claimed depiction at the southern approaches to Aleppo. 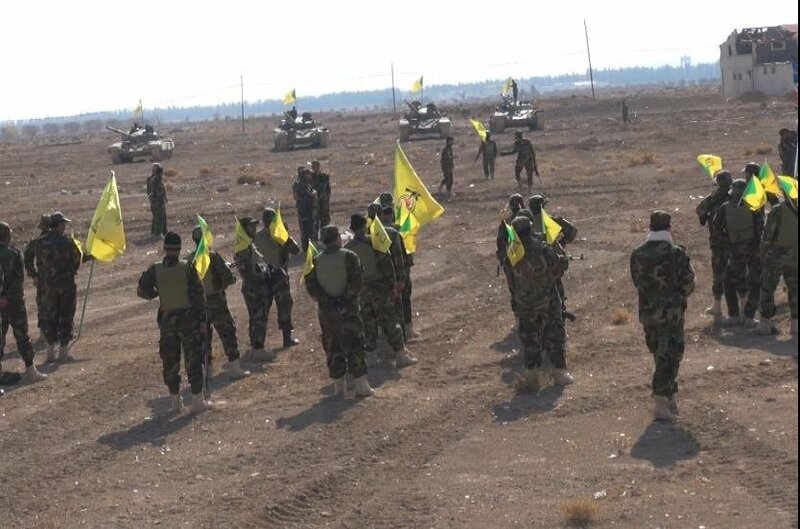 Iran-backed Iraqi Katai'b Hezbollah fighting force members equipped with M16 type assault rifle and PKM general purpose machine gun; claimed depiction at the southern approaches to Aleppo. 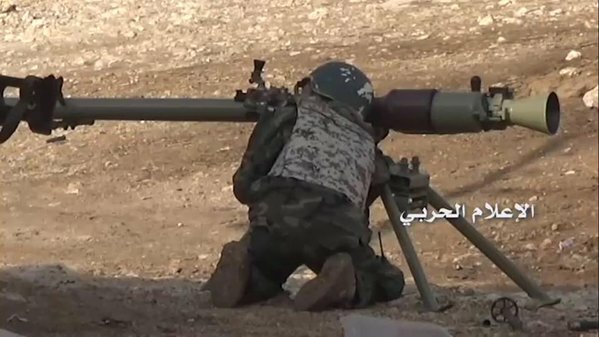 Iran-backed Iraqi Katai'b Hezbollah fighting force member equipped with SPG-9 Kopye (“Spear”) 73 mm recoilless gun; claimed depiction at the southern approaches to Aleppo. IRIAF Lockheed C-130H Hercules (L-382), serial 5-8552 (cn 382-4594) at a Syrian airbase, supporting Iranian mission in Syria. 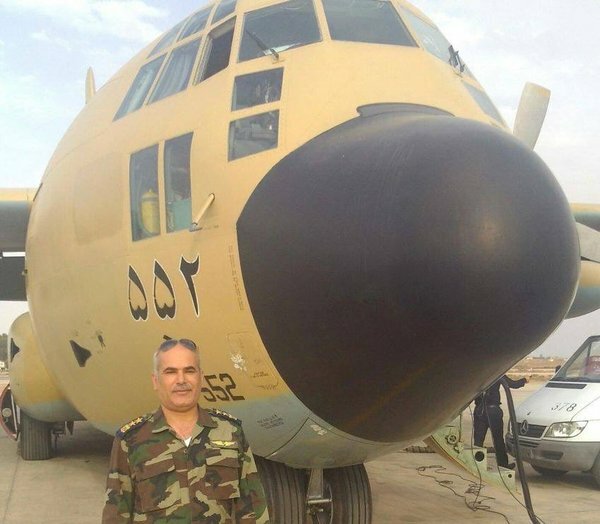 Figure in foreground is a SyAAF colonel, possibly base commandfer. Not all wearing tin hats and no body Armour now. There are around a 1000 different variants of Safir Jeeps in Syria and Iraq now and Iranian footprint is growing. The IRGC and Artesh are getting a lot of real combat experience in Syria and will come out very battle hardened as the Jange Tehmili generation were getting old. Most of the Iranian officers and men in Syria are now in their 20's and 30's and are learning combined arms operations with other friendly forces like Russians, Hezbollah and various Shia militias. 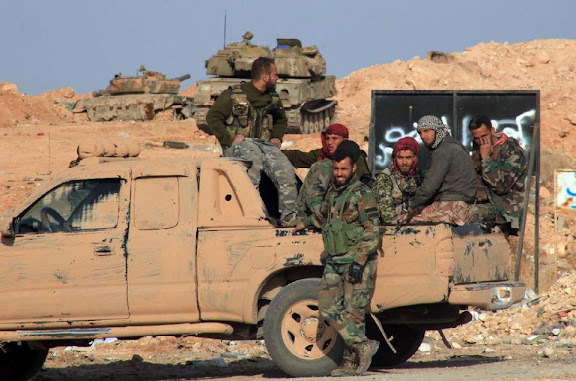 The reestablishment of LOC to western Aleppo was a major victory for Iran-led forces, especially now that the Jihadist group Jund al-Aqsa seized the town of Morek, the last government-held town on the main Aleppo-Hama highway. The safir in front seems to be towing a two-wheeled trailer . I was wondering what is it towing ? It doesn't look like the mlrs. I Don't know but your message is towing the two other similar ones! Heavy 120 mm mortar for close urban support. Original design was Russian, but now produced in Iran by DIO. Razm is an Iranian 120 mm long-range mortar unveiled in 2010 and produced by DIO. This is one of the world's longest range mortars achieving a range of over 16 kms. The biggest problem for SAA is lack of manpower to hold liberated areas. The US and Russians found the same in Afghanistan and previous US defeat in Vietnam. An insurgency is like jelly filled doughnut, you squeeze one end and it coagulates somewhere else. This pattern will keep on repeating itself unless someone is game enough is put about 200,000 men in Syria as to defeat an insurgency 1:3 troop ratio is required. The Zionists are facing an unarmed children's smart phone intifada in Palestine in a small gulag area of barely 4000 sq kms and they have over 150,000 police, IDF, Shin Beth and other armed forces deployed. In Syria, the terrorists are best armed in the world with armor, C4I, manpads and endless US and NATO weaponry. 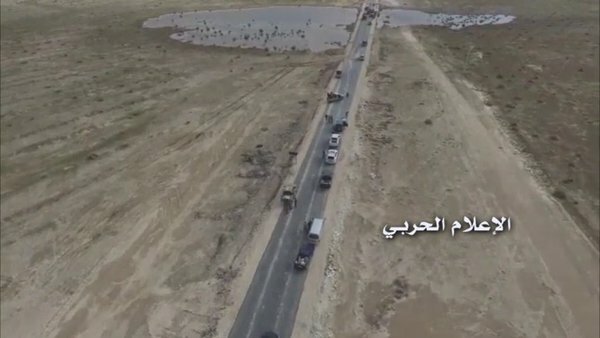 Just last week the Saudis transferred over 1000 TOWS to the "moderate" FSA terrorists and lord knows what else? Pro-Syrian should be changed to Pro-Assad Family Hereditary Baathist Regime, for accuracy's sake. That's all for now. Carry on.